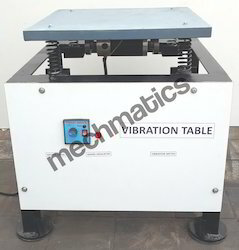 Leading Manufacturer of universal vibration apparatus, cam analysis apparatus, motorized gyroscope, influence of moment of inertia, static and dynamic balancing apparatus and universal governor apparatus from Ahmedabad. 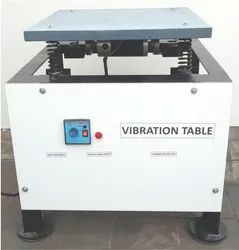 Under rigid supervision of our skilled professionals, we are manufacturing, trading, exporting and supplying a wide range of Universal Vibration Apparatus. Known for its long working life and sturdiness, this product is manufactured employing dexterous workers and high-end techniques in tandem with set international norms. Under the vigilance of our skilled quality controllers, we examine this product on various parameters. Furthermore, our prestigious clients can avail the offered product at pocket-friendly prices. We are ranked and supply the qualitative Cam Analysis Apparatus. The offered range is manufactured by industry experts using top-notch quality components in complete compliance with international standards. 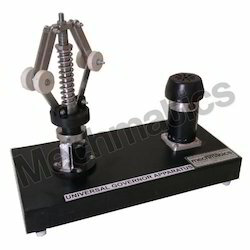 This apparatus is widely used in motors, engines and machinery. Apart from this, we have a brilliant team of quality controllers who stringently check the quality of product to ensure flawlessness. 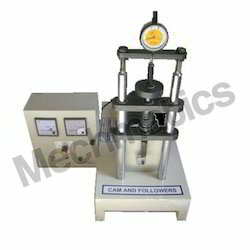 The offered apparatus is well-known among clients as it assists in dynamic investigation of cam and follower mechanisms.The apparatus helps in dynamic investigation of cam and follower mechanisms, as used in motors, engines and machinery. The cam mechanism consists of 3 interchangeable cam plates and 3 different followers. A mass and a spring are used to simulate the valve. In order to demonstrate the “jump speed", the spring rate, mass and speed are adjustable within broad limits. The open design allows the observation of every detail of the movement process. 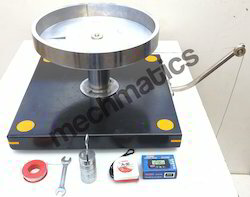 The moments generated by the gyroscopic effect can be investigated using this unit. The basic component is a flywheel driven about its own axis. This is mounted together with its drive motor as a yoke and forms the gyroscope. The rotational speeds of motor is regulated with help of a dimmer. The gyroscopic moment is preselected by simply positioning a counterweight of different size. The gyroscope is a portable table unit. All that is required for operation is a mains supply. Velocity and acceleration of a body depend upon its inertia for a particular accelerating force. The apparatus consists of a flywheel mounted in ball bearings. When torque is applied to it, it starts accelerating If the inertia of flywheel is reduced by weight, then for same torque, velocity and acceleration of lighter flywheel will be greater. Thus effect of inertia upon velocity and acceleration is demonstrated. When weight are attached to the flywheel, an inertia of flywheel is changed. Backed with the team of our ingenious professionals, we are offering the premium quality of Static and Dynamic Balancing Apparatus. The offered product is highly demanded among our clients for its optimum quality and long service life. The entire range is tested on various parameters to ensure the quality. Clients can avail the entire range from us in different technical specifications at reasonable prices. The main element of the bench top unit is a smooth shaft to which four disc with variable unbalance weights can be attached at any angle or distance. The rotor is supported horizontally in ball bearings and is driven by a speed-controlled motor. For determination of the unbalance weight by measuring the balance of moments the driving belt can be removed. Using different weights dragging on the pulley defined moments can be exerted to the shaft. They can be compared with those caused by the unbalance weights when rotating. Fastening of the supporting base with spring neutralizes undesirable vibrations. Our reputation in the industry is largely attributable to our exquisite spectrum of Universal Governor Apparatus. Our offered apparatus has gained extended admiration from every nook & corner of the country as it is used to demonstrate the principle of operation of varied centrifugal force governors. Further, the entire range is intricately manufactured using standard quality components and hard-working work force. Client can avail the offered range from us market leading prices. With our-in depth knowledge in the relevant industry, we are supplying quality assured range of Whirling of Shaft Apparatus. Being tested on various parameters of quality by our skilled quality controllers, we ensure its unbeatable quality and durability. Our adroit professionals manufacture this product by use of latest machine and premium quality components in adherence to the set industry standards. Clients can avail the entire range from us at reasonable prices. Whirling of Shafts apparatus shows how shafts vibrate transversely and ‘whirl’ at a certain rotation frequency. This helps engineers understand possible problems with long shafts and allow for them in their designs.The main part thick powder coated frame that hold a variable speed motor which turns the horizontal test shaft. Two bearings hold the shaft, one bearing at the ‘driven end’ and the other bearing at the ‘tail end’ of the shaft. The tail end bearing slides in its housing to allow the shaft length to change as it ‘whirls’. Similar to a beam on two simple knife-edge supports, both bearings allow free angular shaft movement (free ends condition). Also supplied with the equipment are extra bearings that restrict angular movement when fitted, to give ‘fixed ends’. The apparatus is a set of test shafts of different length and diameter to show how these properties affect whirling. Also supplied is a set of weights to show how concentrated loads affect whirling. One weight has an extra hole to make it an eccentric load. No. of Spring of Different Stiffness: 2 Nos. Governor mechanisms with necessary springs and weights as follows : Watt, Porter, Hartnell, Proell. Rigid platform or sturdy table with preferably a solid foundation. Rigid platform with preferably a solid foundation. 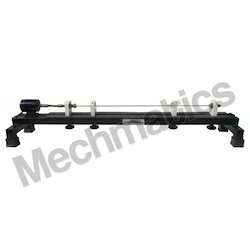 The MECHMATICS journal bearing apparatus for investigating the distribution of pressure in slide bearings illustrates the principle of hydrodynamic lubrication. The distribution of pressure and the carrying capacity can be determined on a sliding bearing model at different bearing loads and speeds. The sliding bearing consists of a bearing journal driven by an electrical motor and the freely moving bearing housing. The bearing is loaded with different, interchangeable weights. In order to view the shifting of the bearing journal in operation as clearly as possible, the model has a large gap and a transparent housing. Both the radial and axial distribution of pressure can be recorded in the bearing gap at 12 measuring points around its perimeter and 5 along the length. The measurements are shown by means of 16 tube manometers mounted on a board. A multi-degrees of freedom (DOF) system is one, which requires two or morecoordinates to describe its motion.In the apparatus force or moment in a shaft produces the linear as well as angulardisplacements. Influence coefficients could be used to relate these parameters (theforce, the moment, and the linear and angular displacements) relatively easily. Theinfluence coefficient method is used to calculate natural frequencies and forcedresponses of such a system. 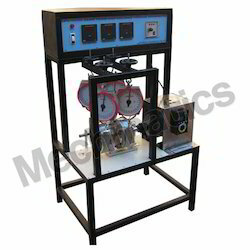 Single Phase Static and Dynamic Balancing Apparatus is widely used for Acedemic and Semi-Industrial training and Testing. We have around 25+ products in various streams like vibrations, balancing, tribometery and machine analysis. 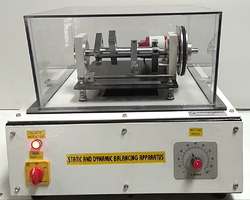 Simple Apparatus to measure Inertia of Flywheel using Stopwatch, Scale and Weights set Additionally the basic Inertia of Flywheel can be changed by adding symetric weights. 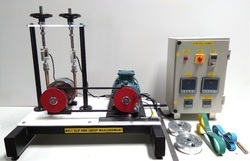 Apparatus can experimentally determine the Moment of Inertia of a Flywheel and axle system . This is designed to provide a simple, clean means of studying rotational dynamics. The simple geometry makes calculating the moment of inertia easy, so that the calculated values can be verified by experiment. One can apply a torque to a allowing a known mass to drop, vertically, and thus accelerates. The linear acceleration of the mass is the same as the linear acceleration of the string, and thus of a point on the axis of the apparatus. That linear acceleration of the mass is related to the angular acceleration of the apparatus by a factor of the radius of the axis cylinder. We can measure the angular acceleration of the rotating platform with help of mass and stopwatch. The moment of inertia can be varied through given extra mass set. This permits good, accurate, reproducible measurements using only a scale, a stop watch, and mass balance. Turn Table Apparatus can experimentally determine the Moment of Inertia of a Disk a Ring and even asymmetrical objects in rotational motion. This is designed to provide a simple, clean means of studying rotational dynamics. The simple geometry makes calculating the moment of inertia easy, so that the calculated values can be veri?? ?ed by experiment. One can apply a torque to a rotating turntable by applying tension to string wound around an axis of the turntable. Hanging a mass from the string, over a pulley, creates the tension. The mass is allowed to drop, vertically, and thus accelerates. The linear acceleration of the mass is the same as the linear acceleration of the string, and thus of a point on the axis of the turntable. That linear acceleration of the mass is related to the angular acceleration of the apparatus by a factor of the radius of the axis cylinder. We can measure the angular acceleration of the rotating platform with help of mass and stopwatch. The moment of inertia can be varied through a wide range.This permits good, accurate, reproducible measurements using only a scale, a stop watch, and mass balance. 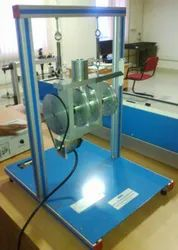 The apparatus is used to understand and measure Belt Slip and Creep phenomenon. Variety of belts can be fitted on replaceable pulley shaft. Digital Load and Speed sensors with variable frequency controllers ensures accurate readings. 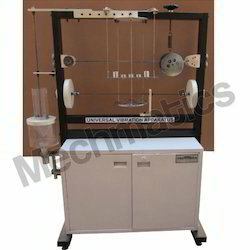 Belt tension gauge is also provided with tension varying arrangement. Pin on disc friction/wear study, involves a sharp pin, ball, or cone tip to wear against the disc surface. Usually a constant normal load is applied from the pin towards the contact interface, using weight set. A lateral force sensor is installed to measure the friction force. During the test, a wear track is gradually made on the disc surface due to the materials loss from friction. 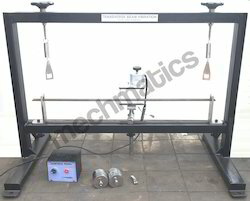 This is measured with help of a gauge or alternatively wear sensor can be used.Rig follows ASTM Test Standard and is suitable for Laboratory use in industrial; academic as well as research purposes. Service Required:1. 230 V.A.C. single phase supply.2. Rigid platform or sturdy table with preferably a solid foundation. By utilizing skills of our ingenious professionals, we are offering a quality assured assortment of Epicyclic Gear Train & Holding Torque Apparatus. Employing dexterous workers and quality approved components, the entire range is appreciated for durable standards. The offered range is available in different technical specifications and is used to experimentally observe and calculate the angular velocity ratios of epicyclic gear train. Clients can avail the offered range form us at industry leading prices. 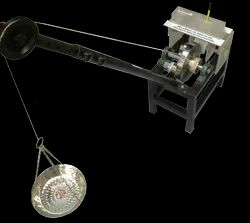 Apparatus allows one to carry out experiment to compare the driving torque for agiven degree of overlap of a belt.Tension is introduced into the belt by hanging a mass from the ring attached to theend. The slipping torque is determined by the addition of a suitable mass attached toa cord wrapped around the drum.The angle of overlap can be varied from 30 to 210 degrees in increments of 30degrees. The pulley is balanced and mounted on bearings to reduce frictional lossesto a minimum. The unit is wall mounted. The apparatus uses a hydraulic analogy to determine Corioli's Component of Acceleration. It consists of two SS tubes connected to a central rotor distributor. 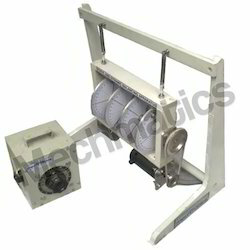 The distributor is rotated by a variable speed PMDC motor. 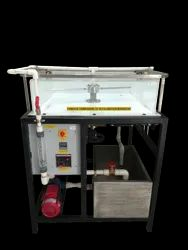 Water is supplied to a distributor by pump though Rotameter. When tubes are rotating with water flowing through, with various measurement provided, Corioli's component can be determined experimentally and theoretically.